The Poole Half Marathon features a fast, flat and scenic course out from Poole Park, around Upton Country Park then back along Poole Quay. There will be the usual great Poole Festival of Running atmosphere, with lots of events going on over the weekend, in the Festival Village in Poole Park. All finishers get a t-shirt and medal. The cut off time for the Half Marathon is 3 hours. Minimum age is 18 on day of race. New in 2018, the first Festival of Running Half Marathon was a great success. 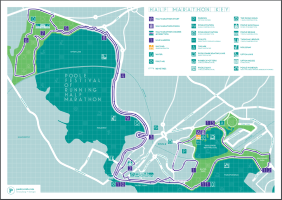 The Half Marathon features a harbourside course heading out from Poole Park, heading down Poole Quay, then a loop around Upton Country Park, before heading back down the quay, along Baiter Park to the finish line back in Poole Park. A fast, flat course is run on roads and compacted gravel paths with plenty of support along the way. It will be fully marshalled with water stations and medical facilities along the route. A full list of entrants is displayed here. Please check your details are correct. Errors can be corrected before the race but NOT afterwards. Number transfers close 2 weeks before the first race. More details can be found on our FAQ page. 9:00 am in Poole Park (close to the marquee). Please assemble from 8:45 am in your estimated finishing time zone. There will be time boards to assist you. Please note that as per UKA licence rules, you are not allowed to wear headphones/earphones as you may not hear instructions from marshals or runners closing behind, especially at water stations. Final race instructions will be emailed out the week before the race, and will also be available on our Facebook page.